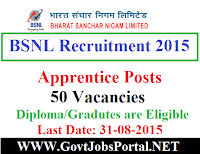 BSNL, Bharat Sanchar Nigam Limited, is inviting application from all eligible Indian Citizens for filling up various Apprentice posts. 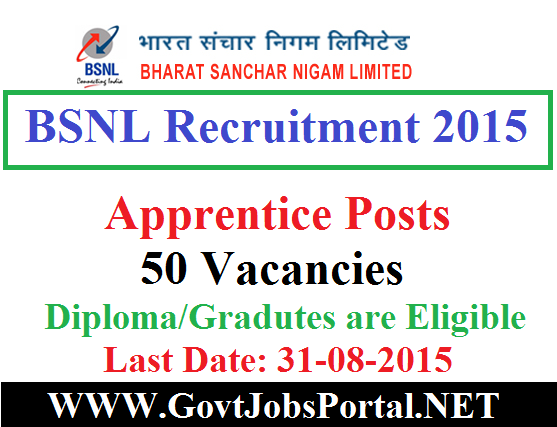 There are total 50 number of vacancies which are going to fill by BSNL under this recruitment process. Read the below article carefully to know the Educational Eligibility & other requirements required to fill this job application. Also must read the detailed official advertisement carefully before applying. Age Criteria: The lower age limit decided by the BSNL Department for this Apprentice Recruitment Process is 14 years. Selection Criteria: Written Exam & Interview. Applying Mode: Candidates have to apply offline by sending the hard copy of Application form along with self attested required certificates as mentioned in the advertisement “AGM (HR), O/o the CGM Telecom BSNL, Jharkhand Telecom Circle, ARTTC Building, Near Jumar River, HB Road, Ranchi – 835217” on or before 31-08-2015. The link of Official Notification is given below.